Good morning, Friends! The holiday season is in full swing! I did manage to finish one of my sewing projects and the other two are well on their way to getting there as well. But I need to finish up a few projects that I started earlier this summer and our get-together is next week! Yikes! Thankfully they were started and just need the finishing touches put on. But I am trying to get back into the stamping routine, too! I missed it! So I hope to have more cards to show you all! Thanks for sticking with me! You are the best!! 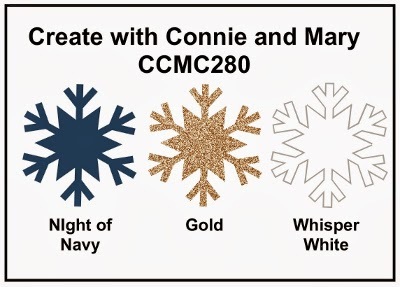 Today is the Thursday challenge at Create with Connie and Mary! And they have a fantastic and festive color challenge! Take a look! These two stamp sets are carry over sets and I am SO glad because I really like them!! I hope you are inspired by my card but be sure to check out the rest of the cards from the fabulous design team at the Create with Connie and Mary website! I hope you will play along this week! Thanks for stopping by and have a super day! Super nice card Deb. So pretty how the embossed tree peeks out and the sponging around the oval really pops! Love this! I agree - simple but oh so elegant. The sponging around the oval is a perfect way to draw the eye to the tree. Your card is so beautifully elegant! Love how you framed the tree in the oval! You're making me wish I had bought this set! Beautiful! 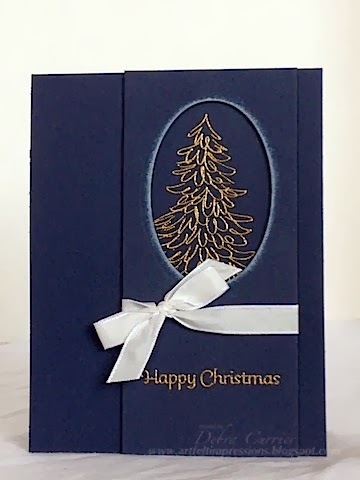 It is definitely simple and elegant, the gold tree takes center stage! Love the little tree peeking out of the oval! Very classy! Very, very beautiful and regal with the gold embossing...love the cut out oval, too! Great job with the challenge this week!